Home » Frequently Asked Questions » What is a “Posted Panel” of Physicians? What is a “Posted Panel” of Physicians? Georgia’s workers’ compensation law obligates your employer to provide you with a list of physicians who will treat you following your on-the-job injury. As you might imagine, however, this simple concept becomes very complicated in real life situations. In theory, every employer in Georgia who employs more than three workers is supposed to post a list of physicians in a location that is readily accessible to employees. This list of doctors – called the “posted panel of physicians” must display the name, address and phone numbers of 6 different physicians, at least one of whom must be an orthopedist. The employer is also required to show the panel to every employee, explain how the employee may go about obtaining care in the event of an injury, and explain that the employee has the right to “one free switch” from one panel physician to another. Of course, there are exceptions to these rules – especially in rural areas. There are also “suggested” elements, such as a provision that a minority physician be included on the panel when practical. In reality, of course, posted panels rarely work as the legislature intended. 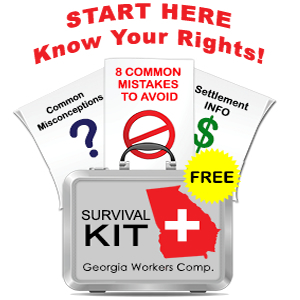 Employers either intentionally or negligently fail to post the panel in the right place, or they fail to explain to their employees about the employees rights under Georgia’s workers’ comp. laws. As a result, injured workers often find themselves very frustrated with their inability to obtain necessary care and confused as to what to do. Human resource managers often do not understand the workers’ compensation laws and the company obviously has an interest in minimizing claims. When we open a new case, one of the first areas of discussion with our clients relates to posted panel issues. If the panel is not valid or if there are other arguments to invalidate the panel, we may be able to arrange for you to treat with a physician who has no ties whatsoever with your company. If we are limited, at least at the outset, to physicians who appear on the posted panel, we can help you make the best choice from the doctors on the panel. If we can make an argument that none of the panel physicians has the expertise to treat you properly, we can file paperwork with the State Board of Workers’ Compensation to change your treating physician. If you have questions about your rights regarding medical treatment following an on-the-job injury, please do not hesitate to call Jodi at 770-351-0801 or to contact her by email using the form on the right side of this page.